UN Secretary-General Ban Ki-moon hopes to visit North Korea in the near future. In a keynote speech at the opening of this year's Asian Leadership Conference in Seoul on Tuesday. The annual conference, now in its sixth year, is hosted by the Chosun Ilbo and TV Chosun and ends Wednesday. Ban said he would seek agreement from members of stalled six-nation nuclear talks to visit the North. The aim is to help North Korea if it extends its hand to come into the global community, he said. 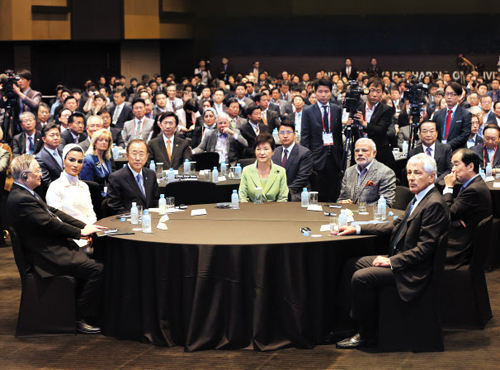 Global leaders and other key figures including President Park Geun-hye, Indian Prime Minister Narendra Modi and UN Secretary-General Ban Ki-moon attend the annual Asian Leadership Conference at a hotel in Seoul on Tuesday. Ban also called for the resumption of the six-party talks, saying that an arms race is heating up on the Korean Peninsula due to Pyongyang's nuclear weapons development. He offered to help Pyongyang build trust in the international community if it is sincerely willing to undertake reforms. Ban was to make his first trip to the joint-Korean Kaesong Industrial Complex in the North on Thursday, but the North abruptly canceled permission on Wednesday morning.